The Auckland Arts Festival is on full swing and a treasure trove of jewellery, craft, talks, and performance art. MARCH 12 – White Night. For the first time the festival offers White Night, a special one night only evening which sees the city turned into a bustling outdoor gallery, adapted from the popular French Nuit Blanche where museums, public and private galleries open their doors throughout the city until midnight with special programmes of performance, music and other art events. 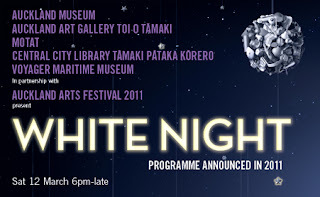 events are part of White Night presented by Auckland Arts Festival. 13 March: 4pm, Public Talk: Dr Rachel Carley on ceramics, still life and the floral. Plus Afternoon tea. 16 March: 6.30pm, Public Talk: Anna Miles on the invented and imaginary world of flowers on textiles. This entry was posted in Uncategorized on March 12, 2011 by kristindagostino.